A prettier rear and a little more isolation for everyone’s favorite roadster. Julien Montousse, Mazda North America design director, is demonstrating the intricate mechanism that folds the roof of the Miata RF into a small space ahead of its trunk. The new car, whose name stands for Retractable Fastback, sure looks stunning whether that powered roof is raised or lowered. The most critical question, though, is whether it still drives with the sparkle and pep that make the newest MX-5, the ND generation, a thing of wonder. Even though I know it’s there, I don’t notice any of the extra weight that comes from installing that powered Retractable Fastback. 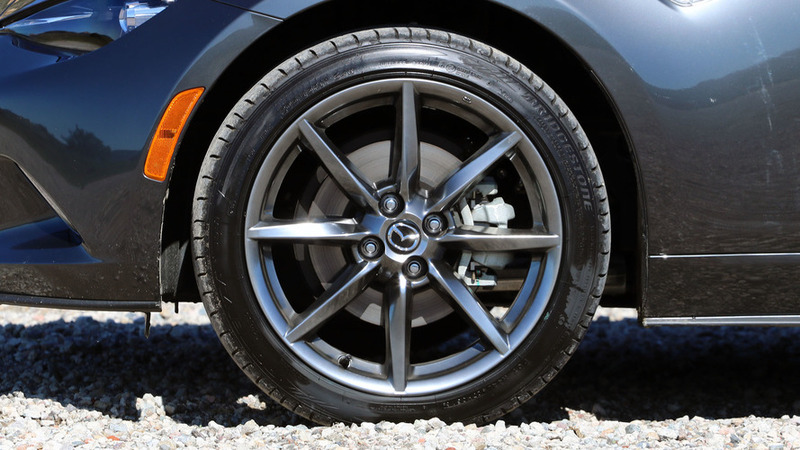 Mazda says that versions with the manual transmission are 113 pounds heavier than equivalent soft-tops, while RF automatics are 104 pounds heavier. One way to look at that is that it’s only increasing mass by about 5 percent. The other way to look at it is you’re making your lightweight sports car 5 percent heavier. To counter that weight gain, Mazda actually drilled extra holes into one of the X-shaped cross braces under the car’s transmission tunnel. And ultimately, 113 pounds is a relatively small gain for such a complex roof. 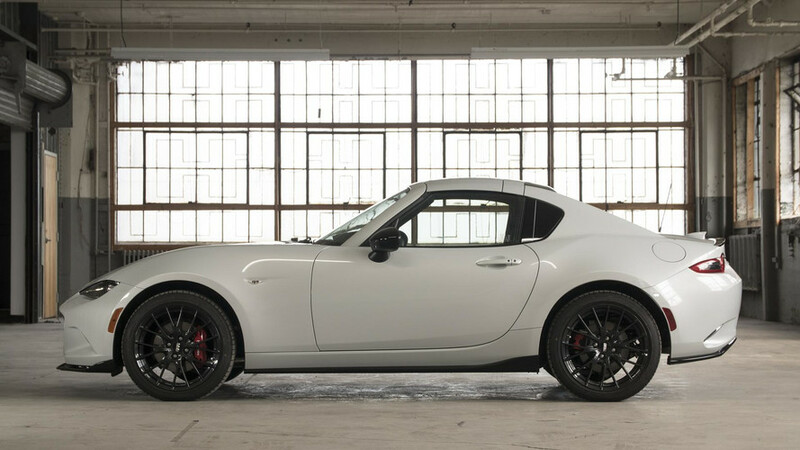 The Miata RF is still one of the lightest production cars you can buy. Ultimately, 113 pounds is a relatively small gain for such a complex roof. 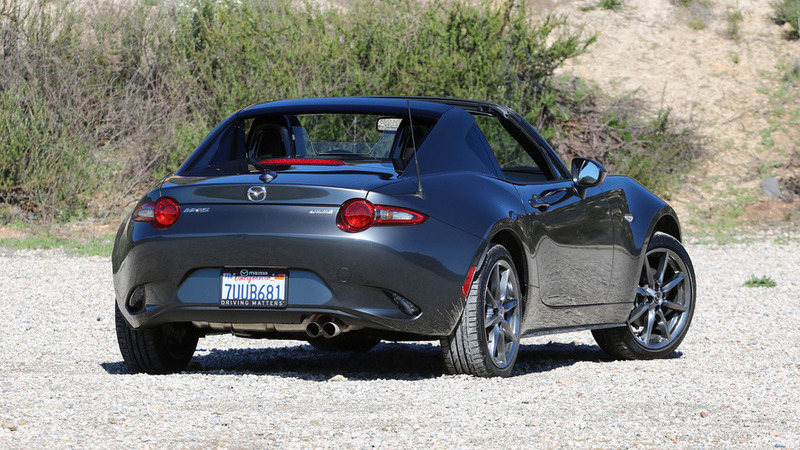 The Miata RF is still one of the lightest production cars you can buy. The folding roof is divided into three components. The main overhead part is constructed from aluminum, with lots of sound-deadening material strapped to its underside. Then there’s a much smaller steel piece, which helps provide the folding articulation necessary for the roof to slink into the trunk. The rear haunches, those elegant buttresses, meanwhile, are made from plastic and only move out of the way to let the rest of the roof move, before returning to position. The folding-top apparatus can be opened or closed when the car is moving at up to six miles per hour. 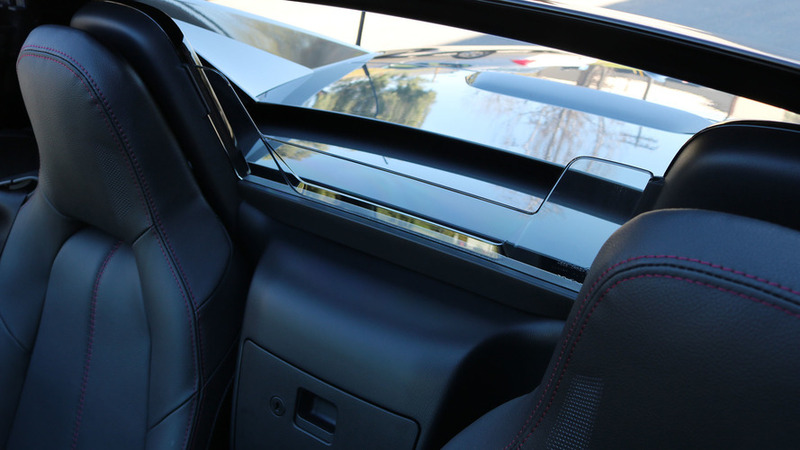 Unlike the old car, you no longer have to latch or unlatch the roof from the windshield header manually. Just hold the small switch (forward and left of the shifter) for 13 seconds and watch the roof parts do their carefully choreographed maneuver. 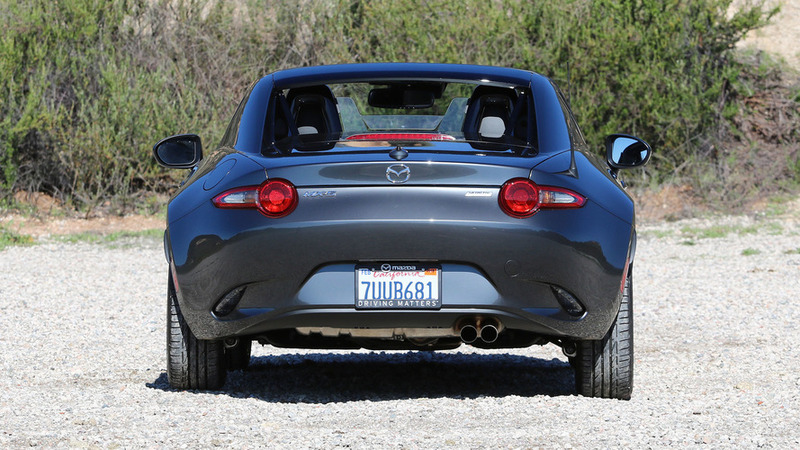 With the roof up, there’s a heated glass rear window behind the driver and passenger that provides decent rearward visibility – there’s still no backup camera offered on the U.S.-market Miata. That window stows with the roof when lowered, so a small clear plastic wind-blocker is all that remains in the opening between the two buttress. The roof bar across their top is painted black, so from behind the car it’s pretty much unnoticeable when the top is down. 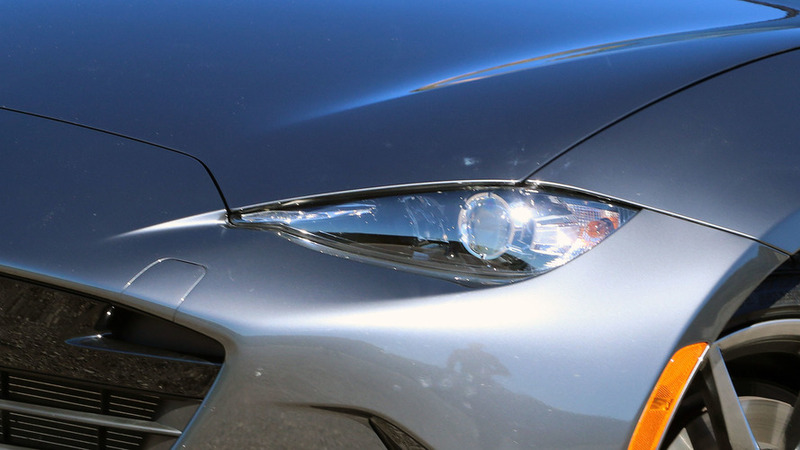 The bottom line is this: The RF is just as wonderful to drive as its fabric-roof progenitor. Sound isolation with the top up, however, is impressive. Road noise booms in from the back of the car and there’s a faint whistle from the door seals, but road and wind noise at speed otherwise fade to a background concern. It’s no louder in here than, say, a Subaru BRZ coupe. Even with its fabric roof raised, the standard Miata is much louder. Mazda says only minimal suspension changes were made for the RF. Most notably, new rear bump stops and retuned rear bushings are designed to improve the predictability of at-the-limit handling and the transition to oversteer. With a drive exclusively on public roads, I had no chance to test this out, but suffice it to say the RF drives just as well as any other Miata. It changes direction eagerly and easily, with a nimble yet forgiving balance. Yes, there’s a decent amount of body roll when you enter a bend, but the car settles very quickly and is unperturbed by throttle adjustments or steering corrections mid-corner. It’s perfectly predictable, with plenty of grip from the 205/45/R17 Bridgestone Potenza S001 rubber. My Grand Touring test car also is plenty comfortable in everyday driving, with lots of road feel coming through the suspension but very few unpleasant impacts. The Club trim has stiffer springs and Bilstein shocks, so I’d expect it, like the soft-top Club, to ride a little bit more firmly than the GT. But the Grand Touring car is compliant enough, with minimal cowl shake over freeway expansion joints, that I’d happily pick it for a long day of, uh, grand touring. 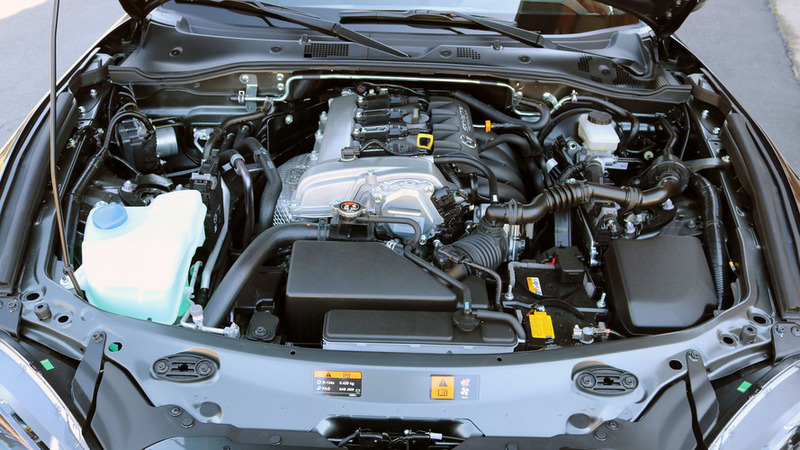 The 2.0-liter inline-four engine and six-speed manual carry over with zero modifications from the soft-top car. Why mess with perfection? The Skyactiv engine is instantly lively off-idle, revving quickly and delivering an amazingly linear and predictable power curve. The gearing is short and torque is relatively modest, so you’re shifting a lot. Doing so is a joy, though, thanks to a gearbox with just the right balance of lightness and mechanical, notchy feedback. Heel-toe your way down the gears again and again, then power up toward redline before the next corner. Oh, and after a few hours of driving like that, the trip computer still read 30 miles per gallon. For enthusiast buyers, the RF is not the car to get. But for everyone else, there’s almost no downside: If you like the RF, buy it. The RF is offered only in Club and Grand Touring trim levels, skipping the base Sport configuration offered on the standard Miata. The RF Club is $2,755 pricier than the soft-top car, at $32,390 with the manual transmission or $33,120 with an automatic. The RF Grand Touring adds only $2,555 over the regular Miata, listing for $33,445 with the manual and $34,660 with the automatic. Soul Red or the Machine Grey paint you see here adds another $300, the Brembo brake/BBS wheel pack for Club trims is $3,400, and Crystal White Mica paint is $200. In terms of equipment, the RF is pretty much unchanged from other Miatas, save for the introduction of a full-color trip computer in the left-hand binnacle. 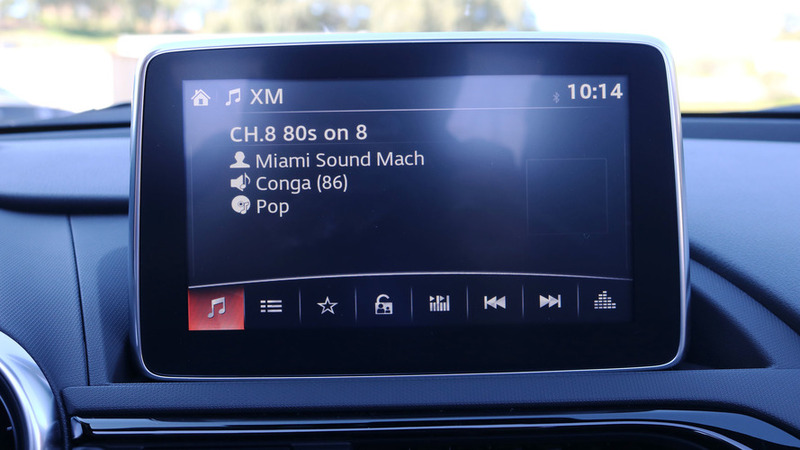 On the RF Club, you get cloth seats, Mazda’s seven-inch infotainment system perched atop the dash, extra chassis bracing, the aforementioned suspension upgrades, a limited-slip differential, blind-spot warnings, and a nine-speaker Bose sound system. Moving up to the Grand Touring adds heated leather seats, lane-departure warning, push-button start, navigation, and automatic climate control, though you do without the Club’s suspension and differential enhancements. 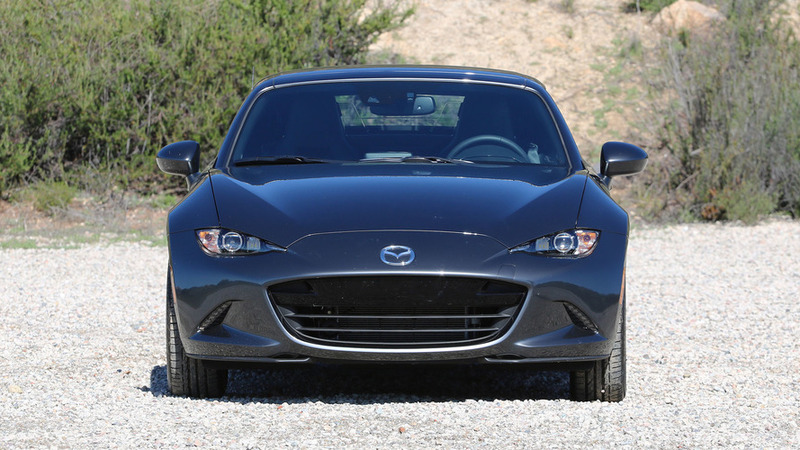 So, who will buy the Miata RF? 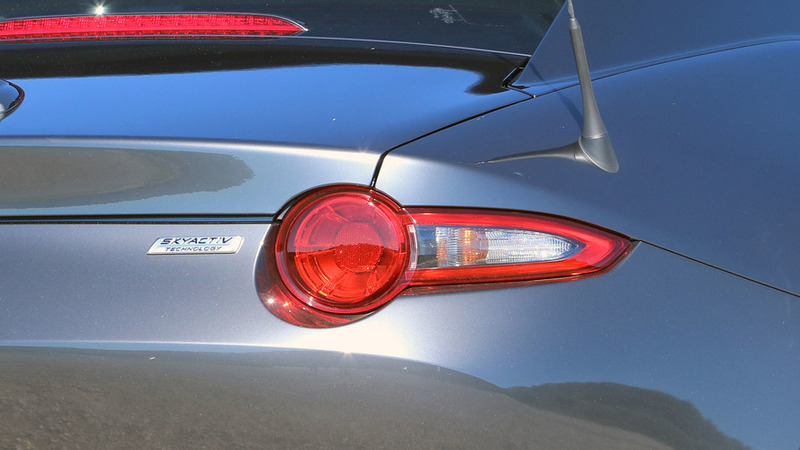 The last-gen Miata’s Power Retractable Hard Top (PRHT) model generally attracted wealthier, older customers who were more likely to opt for an automatic transmission. 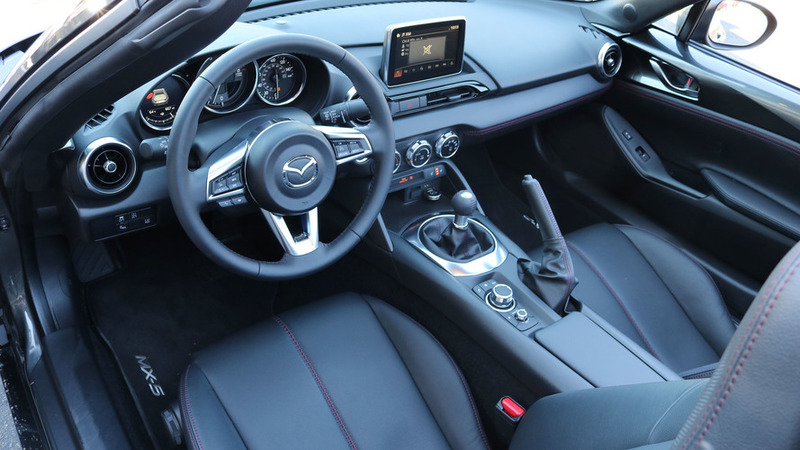 Mazda says that with the launch of the RF, the car buyers’ average household income will probably rise while the stick-shift take rate will decline. 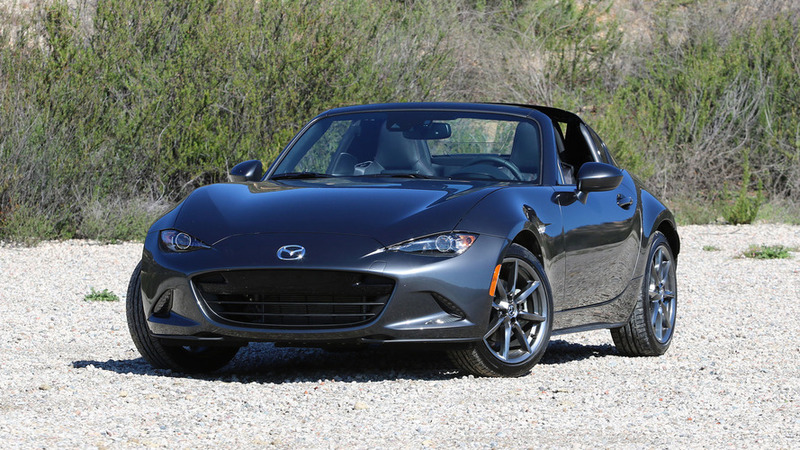 For reference, so far buyers of the new Miata soft-top have an average income of about $130,000, are 60 years old, and about 60 percent buy the manual gearbox. For enthusiast buyers, the RF is not the car to get. 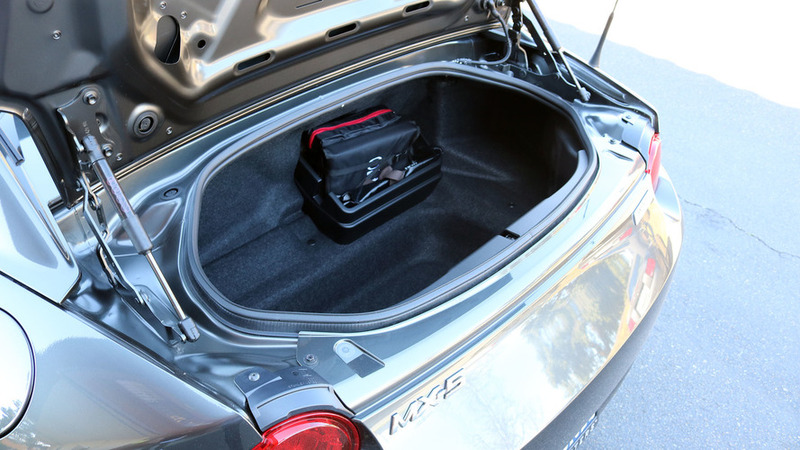 Its extra weight and cost go against much of the reason an apex-loving driver would buy a Mazda MX-5 in the first place. For everyone else, there’s almost no downside: If you like the RF, buy it. 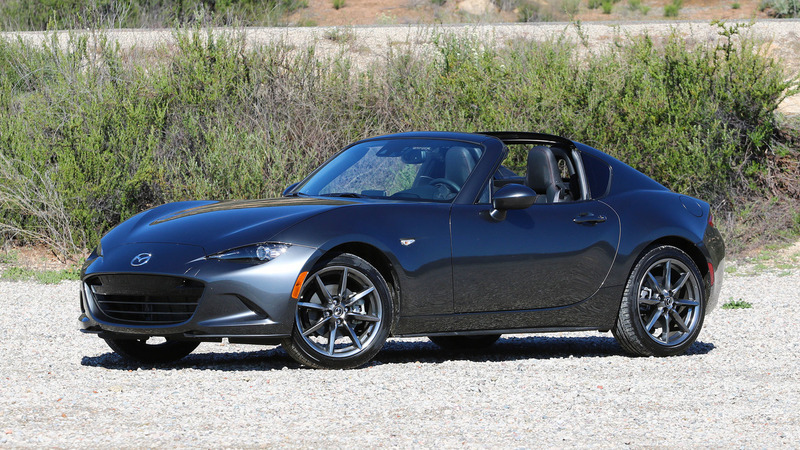 You get a little more isolation from the elements with the top up, that gorgeous new bodywork, plus a little more security and weather-resistance for parking outdoors, all without diluting the core principles of the Miata experience.